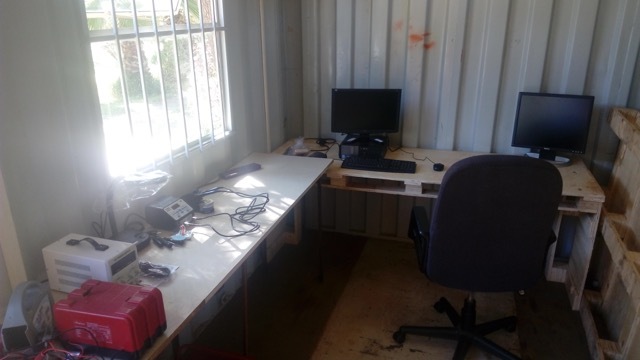 This is an email detailing the distribution of a container sent by MEMO in November 2018 to EFCCM missionary Susan Janetti who runs the Zimbabwe Gecko Society that works fighting poverty in Zimbabwe. 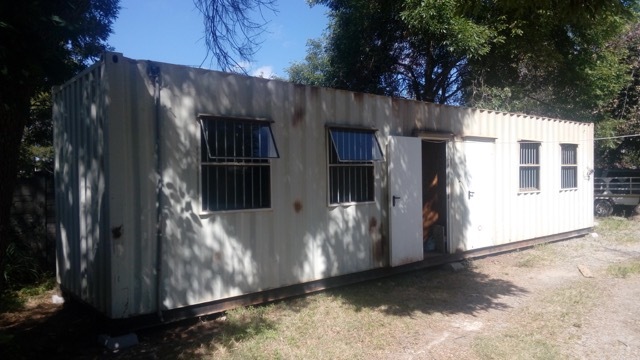 We’re very grateful the MEMO container was not at Beira when Cyclone Idai recently struck that port city and moved on to eastern Zimbabwe. Prayers are needed for both nations at this time as the destruction and death tolls in those areas are heavy. The MEMO container only left Beira last week and arrived Friday. MEMO has done a fantastic job of labeling the boxes and it has made distribution fast and easy. Every box had its contents labeled on the outside. I will be delivering the last boxes today. The final boxes will go to Wedza (A destitute Zimbabwean medical facility) next Friday when we deliver what wouldn’t fit into the 10-ton truck filled with medical supplies. That same day we will also attend the celebration of giving and receiving with local MP’S and dignitaries. What a rush it has been to distribute everything in two weeks. 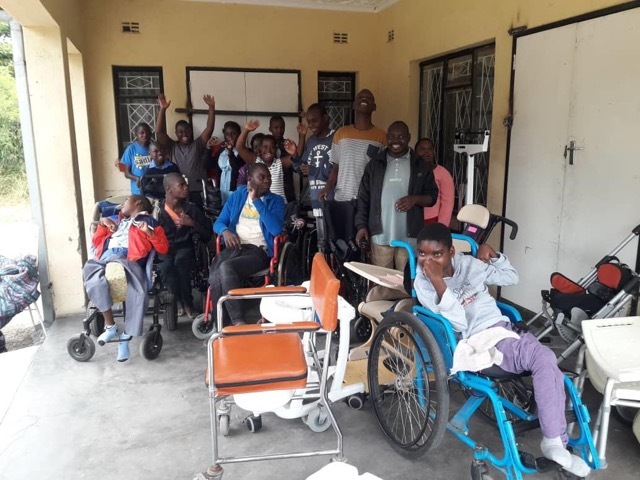 Two days ago we delivered 20 small adult and child wheelchairs, commodes, blankets and sheets to a home for disabled children (see pictures below) The only children’s orphanage in Zimbabwe was given beautiful quilts and toys and they were all delighted! Alison Markham and the Valemount team made this happen. This orphanage houses 80 children out of the 1.4 million orphans in the country. The first few kids didn’t know what to do with their dolls; it was only when we walked away that they showed joy as they realized the gifts were for them. Today we delivered goods to Kenyon, a young man with a heart to teach electronics to young men in Zimbabwe. Kenyon does this free of charge. We provided him with a pallet full of electronics that Memo had packed into the container. They said they were blessed and encouraged as well as thankful. We also delivered to three programs in Chugutu: gardening supplies, sewing machines with accessories, fabric, carpentry, school supplies, Gleaners food, books, bibles, tools, etc. They could hardly believe their eyes! A cash donation was also given which was sent by a member of our church in B.C. Mt. Mary’s hospital and Wedza clinics are delighted with the mound of supplies delivered in a very full 10-ton truck. Harare , Norton, and Karunda hospitals were also delighted with their huge piles of supplies. All of the Canadian doctors headed up by Dr. Ray Markham (A university medical professor from B.C.) left today to return to Canada, tired but knowing they made a huge difference. They ran a clinic in our new Rasper empowerment center. Another at CTT (Center for Total Transformation) also Karunda hospital. They treated hundreds of patients and looked over several of the folk I have been treating. I am now officially Dr. Seuss lol. Most of all, a partnership meeting including perspectives from the ministry of health, health administration, university, health providers, citizens, and community groups, were held to discuss and plan for the next 5 years. Discussion revolved around plans for social accountability and medical stability in Zimbabwe. We had a lot of laughs mixed in with the sweat! Great team. This Sunday (March 17) at 11:00 am, will be the opening of the new Rasper church. You might even hear them singing in Canada. The excitement is huge! I will be there to celebrate with them; they say the service is from 11 to 3!! Next Thursday we celebrate the entire project opening (2 ocean containers with a roof suspended between them, housing a community centre, a church, a library, a carpentry training centre and a sewing school)which was a huge job and we admit to running an $8,000 in debt with EFCCM to complete and make it fully functional with water, toilets, and electricity, but it is so worth it. I hope you agree and won’t mind helping this figure return to black. The shop is running full tilt, saving local people the 10 km walk to the main road, plus the bus fare (which they don’t have) for the next 10 km. Sewing contracts for the sewing center are already coming in. There is a great tailor, delighted to finally be able to support his wife and kids, and he will be teaching others. The carpentry workshop has the first 15 students who are learning to build beds. The computer room has a volunteer teacher. A new ECD (early childhood development) teacher has been found; she will start next week. The clinic is running full tilt and the doctors from Canada gave it a good start with their work . The garden is planted with compost having been made in advance. A goat house has been built for 100 goats with a secure run. There are 20 goats in place but clearance must be obtained to buy more goats as there is Foot and Mouth Disease in the area. Clearance is expected soon! And we will add another 20. When their goats have kids, they will give 1 goat to another etc. until the whole community has goats for milk and profit. The project should expand to about 600 in the next few years when we will then distribute two goats to each community member. Phew!! Looking forward to home (B.C.) and getting a rest soon. My driver keeps suggesting I take a lunch break but I reply that there is no time and so he doesn’t take one either. Despite the pace, I’m loving what we are doing as we have witnessed so much provision from the Lord. Just as an example, yesterday the carpenter said that the only thing missing from the workshop was a router and another tool. While packing the medical stuff for shipping to Wedza we found a misplaced MEMO box with those tools in it. God is full of surprises for us. I hope to arrive home March 26 but after 3 months away the body has to make adjustments.